Thanks Ness for your kind support. Sorry to say that we don’t actually have an automatic solution for this. For 2 sided machined parts, place the second face machine files in a separate folder and nest the remaining files. The development team are working on reorganizing Polyboard and OptiNest export functions to take this situation into account. So hopefully we will be able to offer you an easier solution in the near future. I have read your post carefully. But i cannot delete the face code because other panels have both side drilling. This is due to the <f> code in the post processor. See my last message for more details. If necessary you can request a TeamViewer session for me to set this up for you. My problem is that on one cabinet, left side and right side panel only be drilled on 1 side only. BUT when i do dxf post processor export, it created Left side panel with drill on layer Face 1 (f1) and Right panel with drill on layer Face 2 (f2). Can we make it creat drill on same layer (f1 for example)? Are you talking about drilling the cabinet sides or horizontal (side) drilling of the panels? If the problem is the layer name of the vertical drilling of the panels, you can adjust in the pp setup . 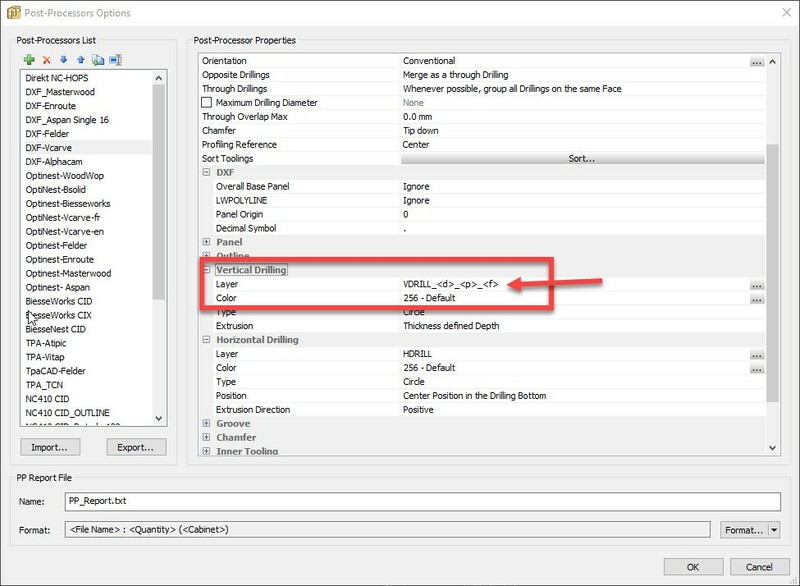 In the vertical drilling section you can type in the layer name you want and insert variables for depth <p>, diameter >d>, face <f> etc. If the layer name includes a face code <f> just delete it. – Left side panel: the drilling holes are put on face 2. How to make all the drilling holes on same face (same layer)?